One of the things we looked forward to with the move was the chance to live differently. Besides evolving our home living, we have also been really involved in the culture here. No, I don’t mean hula, luaus, and playing the ukelele. 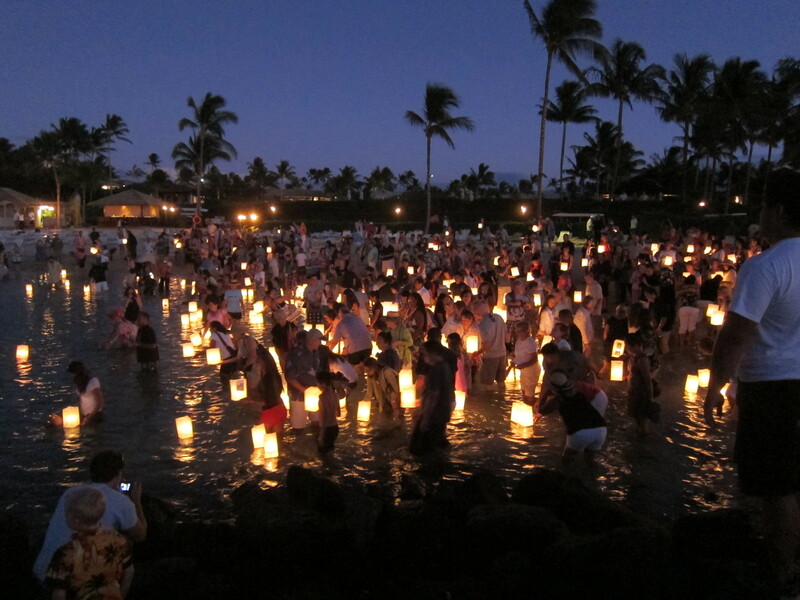 While those things are all part of Hawaiian culture, it’s more of a special occasion sort of a thing, not daily life. Active Outdoor Pursuits. There is no shortage of outdoor activities here and plenty of participants for everything. Swimming: The Kailua pier is the starting point for many recreational swimmers and dozens of people swim out into the bay every day. 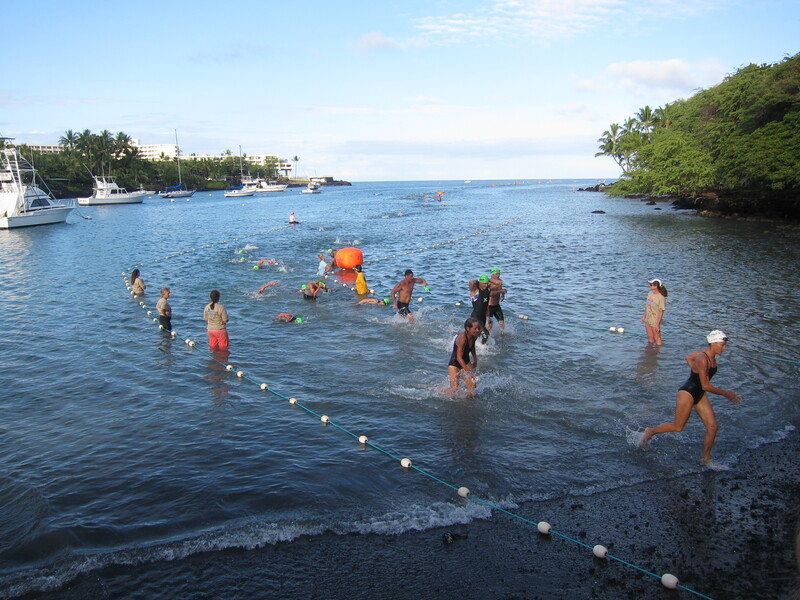 There are also swimming groups that meet up for the swim and socialize afterward. 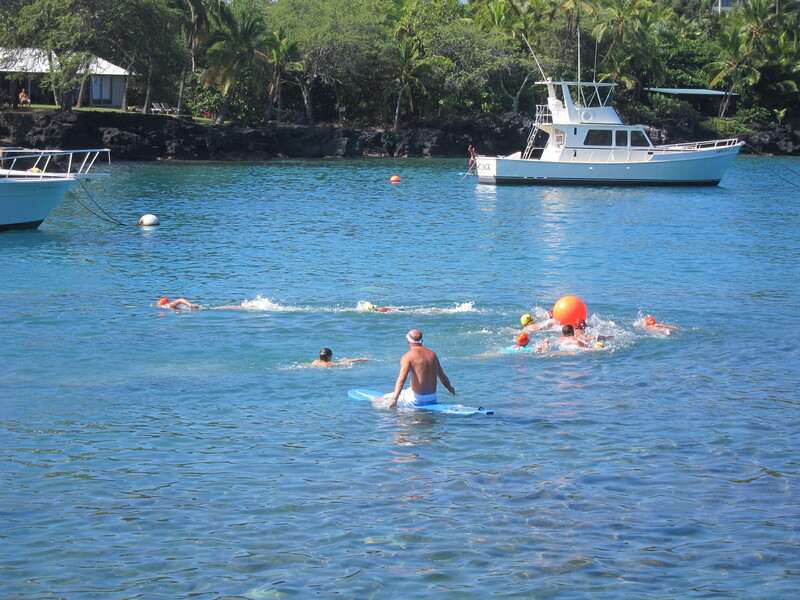 Our landlady took us on our first ocean swim last Friday and we had a great time doing it. Biking: Lots of people bike, and there are serious training groups as well as casual “fun rides” throughout the week. Canoeing: Many people go out for morning outrigger canoe rides. There are a couple local canoe clubs and people can just show up to go out for a peaceful trip. There are also plenty of serious races and competitions. 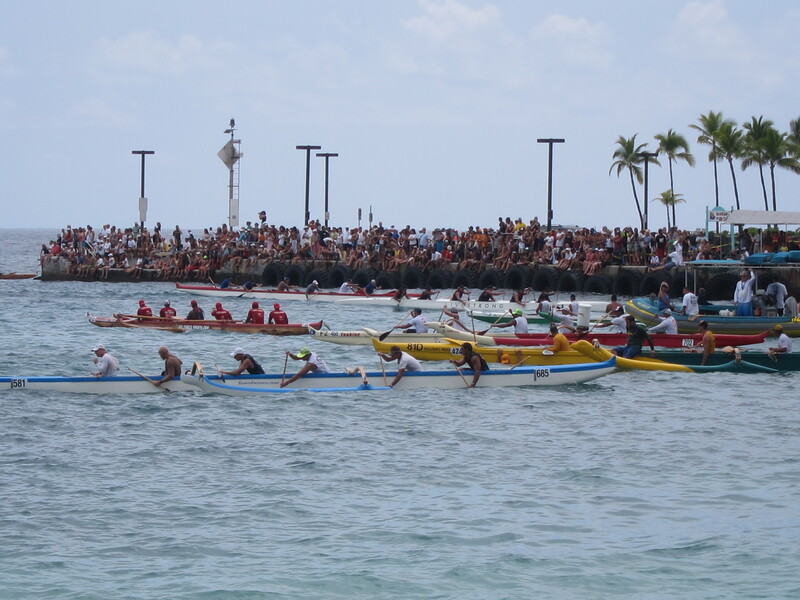 We just hosted the Queen Lili’uokalani race this past weekend, which covered hundreds of teams. Races: Besides the Ironman race (coming up in about a month! ), there is a race event almost every weekend. Triathlons, biathlons, runs, swims, bike races. There is also a series of races called Peaman events which are mostly for fun, and cover different distances and activities. The whole point of them is to bring the community together and get families active. While there are a few rules to these races, fun is probably rule #1. 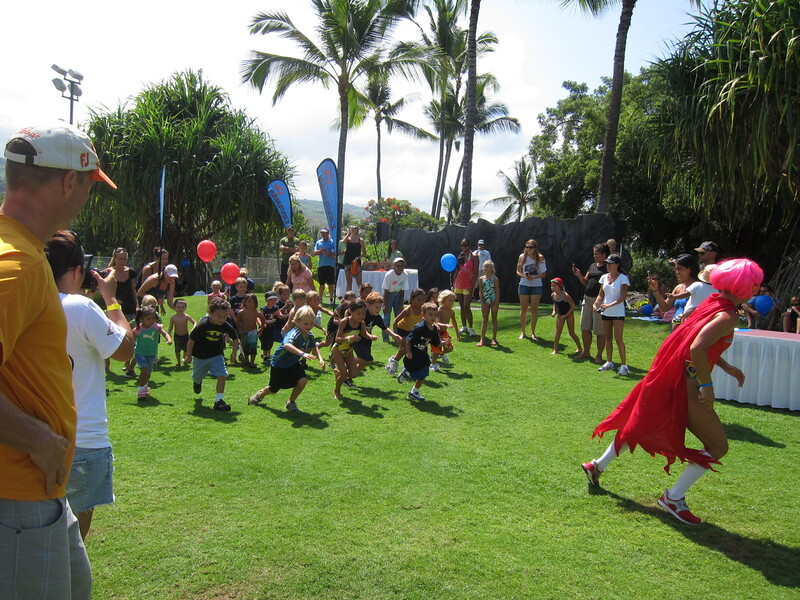 Our kids took part in the keiki race recently, as part of the Lavaman Triathlon weekend. Water Sports: Surfing, boogieboarding, stand up paddleboards, kayaks, snorkeling, diving. Most people seem seem to do at least one of these. We’ve been doing a lot of snorkeling and boogie boarding lately. Looking forward to doing the other stuff over time. Most of these festivals are on the small side – 100 to 400 people attending at any given time. There are usually a few vendor booths which relate to the particular festival. Then there will be many booths that have nothing at all to do with the festival theme. Usually it’s local folks selling coffee, juices, soaps, all sorts of other crafts. There’s usually some sort of local entertainment going on, as well. Bands, dancers, drummers, that sort of thing. We’ve had a great time going out and seeing all these different things. The kids have been fairly compliant, even if they do sometimes get a little hot and bored. Most of these festivals have several kid activities, so there’s usually something in it for them. One thing that’s been neat is hearing the kids recall certain elements or just incorporate parts of these activities into their play. Just the other day, Beckett wanted to play “Dragon and Ninja” based on one of the shows that we saw at the Kona-Hiroshima peace festival a few weeks ago. There are still plenty of festivals, races, and fun ahead (such as a stand-up paddleboard event on the 24th), and we’re looking forward to doing more great stuff.